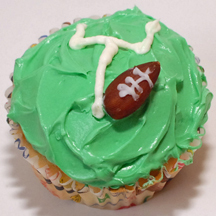 Score some points at your Super Bowl party, or any other football themed event, with these cupcakes featuring a goal post and a little football made from an almond. What You Need: 1 cupcake (baked and cooled); icing tinted green; white icing; pastry bag with #1 metal tip OR tube of writing icing OR cut a corner off of a plastic sandwich bag to pipe icing; almond. How to Make It: Frost cupcake green. Pipe white icing into goalpost shape. Holding almond, pipe white line and then 3 or 4 lines crossing it to make stitches on football. Place football near goalpost. This entry was posted on Wednesday, January 16th, 2008 at 4:00 am	and is filed under sports cupcakes. You can follow any responses to this entry through the RSS 2.0 feed. Responses are currently closed, but you can trackback from your own site.